Daniel qualified at Newcastle University in 2005 and joined Barker Dental Care in April 2015. Daniel is originally from Holmfirth in West Yorkshire and relocated to the south coast in 2014. 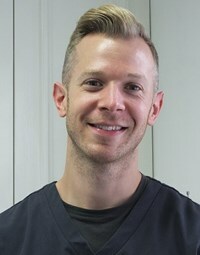 Daniel is enthusiastic about dentistry and continually strives to perfect his skills through continued education in restorative and cosmetic techniques. He has also undertaken postgraduate training in dental implantology, Inman aligner orthodontics, and facial aesthetics. Daniel is a very experienced dentist in many aspects of modern dentistry and aims for excellence whether providing routine simple dentistry or more advanced cosmetic dentistry. Daniel has a very warm and friendly manner and has been very popular with his patients. This coupled with his experience and knowledge of dentistry will make Daniel a good addition to our team and provide our patients with excellent customer care and high quality private dentistry. Away from work, Daniel enjoys walking his dog, Hugo, playing tennis, and going to the gym along with attending the theatre and listening to music. I have had three appointments at Barker Dental Care. I would like to pass on just how great this practice is!! The dentist I have been treated by is Mr. D. Jenkinson. The treatment I have received is of the highest skill with such care at the same time. I cannot recommend Mr. D. Jenkinson highly enough. He really is a superb dentist. Mr. D. Jenkinson I feel would satisfy any patient, though for anyone who may be a little nervous of a visit to the dentist, I really cannot think of anyone better than Mr. D. Jenkinson to see. I should add all the reception staff are so friendly and helpful and they are the first people one meets at any practice.